The reviews promised one of the summer's funniest plays, 'Carlo Goldoni meets Harold Pinter in a riotous farce set to skiffle', and as summer slips away I think that's what we got. The cast headed by James Corden, of 'Gavin and Stacey' fame, seem to be enjoying themselves as much as the audience, although for those of us watching the filmed performance, we definitely missed out on the interaction which the theatre performance must have. It is said that the director Nicholas Hytner had to ask the actors to stick to Richard Bean's script as they were having such a good time ad-libbing! The story, from the 18h century comedy by Carlo Goldoni, is a farce in the tradition of the servant who tricks his master. Our hero, Francis Henshall is fired from his skiffle band and becomes the minder to a small time gangster who is really a woman posing as her dead brother – who had been killed by her public school boyfriend. Francis spots the chance of an extra income by working for this toff and feeding his gargantuan appetite. His task is to keep the two masters apart. Once you have got this straight the fun begins – an evening of traditional farce and Carry On style word games. Corden's comic genius is matched by Jemima Rooper as Roscoe/Rachel Crabbe - the transvestite crook, and Oliver Chris as Stanley Stubbers who bears a disturbing resemblance to David Cameron. Suzi Toase provides the love interest for Corden who is constantly torn between the attractions of the bed and the dinner table. Tom Edden, as an octogenarian waiter who performs a routine of physical comedy which echoes that of silent cinema. All this takes place to the background of Grant Olding's skiffle songs. 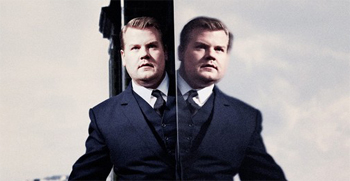 On his return to the National Theatre following his career making performance in 'The History Boys', Corden confirms his comedic skills. It is an evening of hysterical laughter both on and off the stage – probably better experienced live, but thank goodness for the NT Live experience which gives those of us outside the capital the opportunity to see the best of our National Theatre's work.